Whilst planning my recent trip to Malaga in southern Spain, I decided to incorporate a day of the travels to Granada. To go and see the Alhambra, somewhere that I had wished to visit for a long time and hadn’t yet gone. Google at the ready, I booked two tickets for Adam and I to explore the Red Castle, the meaning of the word Alhambra translated into English. A top tip when booking ahead, the tickets are released three months in advance and sell out pretty quickly. 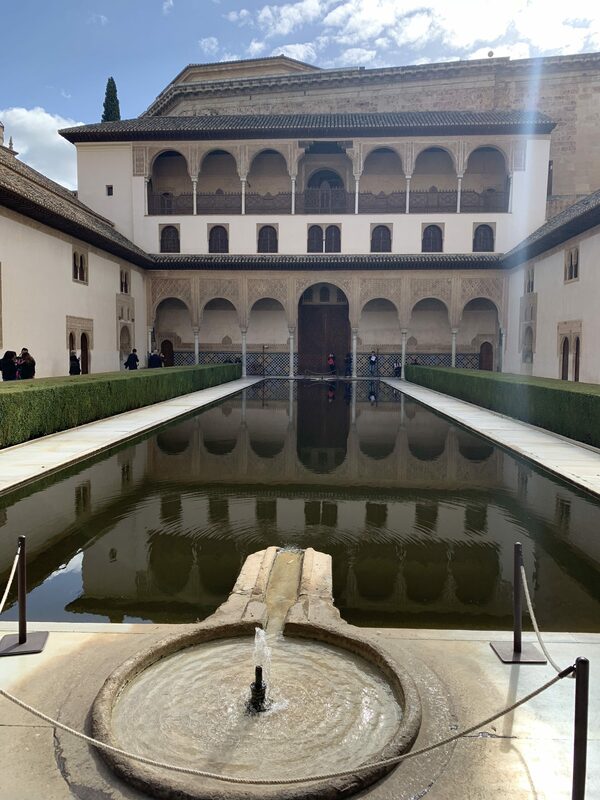 I opted for two of the general tickets at 14 euros per person and I was allocated a time slot to visit the Nasrid Palaces, this is the only area you have to have a time to explore. Do make sure you are there ten minutes or so before and don’t be late as you will be refused entry. I printed off a copy of my tickets are you need to show proof on arrival and as you move around the vicinity. Fast forward to mid November and our arrival in Spain, after a couple of days sightseeing around Malaga city centre we had to decide how we were going to get to Granada. I had assumed that the train would be our best option, never assume! It wasn’t as it would take nearly four hours with a change at another station en route. The bus was the answer, I can’t lie I wasn’t thrilled at the prospect of being cooped up on a hot bus for hours. How wrong I was… we booked our tickets online with GoEuro and it cost 23 euros per person return. We arrived very early the next morning at Malaga Bus Station, about a 25 minute walk from the centre, so decided to grab some breakfast over the road at a small cafe. Our bus pulled up on time and we had our tickets checked by the driver, from our mobile confirmation. It was modern and comfortable, the journey took 1 hour 45 minutes and I slept like a baby the whole way. On arrival in Granada you can take a bus or taxi to the Alhambra, we decided to take a taxi to the city centre to have a wander before we visited the Alhambra. Our Spanish isn’t good at all and this was one of those moments when it was most needed, even google translate wasn’t helping. However we got there and explored the centre, taking in the cathedral and the fantastic architecture on offer. After our whistle stop tour, we got a taxi to the Alhambra a mere 10 minutes away. After showing our tickets to enter, we decided to get an audio tour as we didn’t have a guide, this cost 6 euros each and it was well worth every penny. As you were talked through every area you entered, simply by entering the number you saw allocated into your iPhone device. Highly recommend if you are intending to visit. 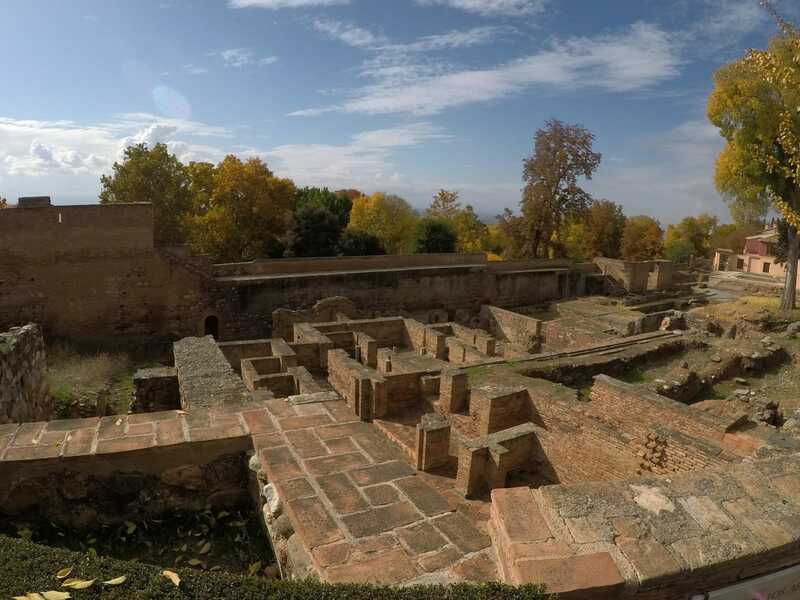 As you walk into the grounds you are guided by signposts to each of the areas, Generalife, Palace of Charles V, Nasrid Palaces and the Alcazaba. We followed this route, make sure to allow a good twenty minutes to get from Generalife to the Nasrid Palaces walking for your allocated time slots. I would certainly recommend three to four hours minimum to see everything on offer and at ease. We were there nearly five hours and it was at a relaxed pace with a lunch stop. Another great plus point is that the food stalls and shops aren’t badly priced, 3 euros for a freshly made sandwich isn’t bad at all compared to what we are charged back in the uk at tourist attractions. Generalife included the summer palace and country estate of the Nasrid rulers, it also became a UNESCO world heritage site in 1984. This beautiful area was the place the kings of Granada came to relax and get away from everything at the palace. This was my favourite area by far, it was stunning and so photo worthy, with gorgeous gardens and water features galore. You could wander till your heart was content, it was very green and pretty in every aspect. The best feature was the waterfall staircase that was specially opened at that time in November, we were lucky to see it and be able to walk up and down the stairs. A perfect place to relax and enjoy life, with breathtaking views all around. The name Generalife meant the architects garden and I was completely in love with the whole area. At the Palace of Charles V you will see a magnificent Renaissance building, Charles V who was the king and emperor ordered the palace to be built when he visited Europe on his honeymoon, as he was so amazed by Granada. It is brilliant to discover inside and walk up the stairs to take in the wonderful grandeur. Nasrid Palaces, our time slot was half two to see the palaces and I was excited to explore them. My first thought upon entering was that I felt transported back to Morocco, this area is full of Moorish style courtyards, halls and the Royal quarters that were truly opulent. This was the residence for the kings of Granada and building started back in the 14 th century on the palaces. There are three buildings, The Mexuar which is the oldest hall, the Palace of Comares and the Palace of the Lions. Here you will find it is by far the busiest of areas, you may struggle to get a perfect shot. There are defiantly many comparisons to be made between here and some of the buildings in Marrakech, such as Le Jardin Secret and the Bahia Palace. Make sure sure to explore it fully and absorb the finer details. The Alcazaba was our final place to discover in the Alhambra, it is very interesting to see as it is the oldest part of the whole area and the name in Arabic means citadel. This fortress has stunning panoramic views of Granada below from its watchtower and the origins date back to the 13 th century when Sultan Alhamar built it. He was the very person that founded the Nasrid dynasty. A great end to a fabulous day. Alhambra certainly lives up to its fame of being the most visited tourist attraction in Spain and one of the most visited attractions in Europe. We absolutely loved our visit and I have since recommended a visit to everyone I have spoke too. A lot of places are given the ‘must see’ badge but the Alhambra in Granada certainly deserves to be seen and cherished by all. It has certainly made quite an impression on me.